Thank you to fellow-writer, Regina Garvie, for posting this interview about my book. Please visit her site to view the full interview—this is just her introduction. Today I have the pleasure of featuring a different type of book on my blog!SCBWI Oklahoma member Amy Dee Stephens writes fiction, but is also the author of two books on the Oklahoma City Zoo. I got a chance to look at her book recently, and it’s a must-see for anyone who has interest in animals, Oklahoma history, or a first-class zoo’s transformation through the years. From the book’s description: What started as a small menagerie in 1902 officially became Oklahoma City Zoo in 1903. 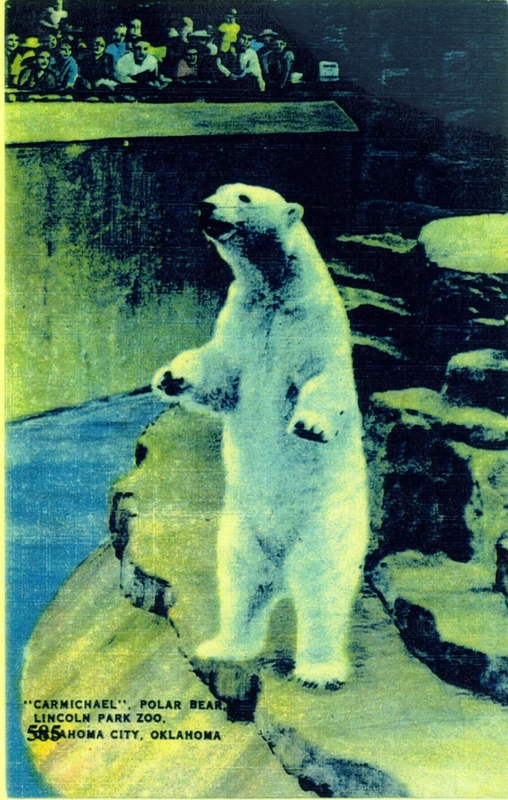 Journey through the second half century of its illustrious history in Oklahoma City Zoo: 1960–2013. Meet the staff and animals and explore the exhibits that propelled it from a third-class animal facility to one of the best zoos in the United States. In the 1960s, its animal population exploded as knowledge of animal care improved. The zoo soon assembled the largest-known collection of hoofed animals. Later, a rare mountain gorilla named M’Kubwa stole newspaper headlines, a third leopard escaped, and the zoo met its first cheetah babies. The opening of Aquaticus in the 1980s “brought the ocean to the prairie” in the form of a dolphin and sea lion show. Elephants, however, remain the queen attraction at the Oklahoma City Zoo. In 2011, the birth of the zoo’s first baby elephant baby, Malee, was a crowning achievement in its 110-year history. Personally, I remember a lot of the changes that took place at the zoo, like when they built the Great EscApe when I was a kid, and the transformation of the big cat areas and new habitat for the elephants. It’s pretty dang great. If you’re in the area, you owe it to yourself to check out our zoo – and maybe pick up a copy of Amy’s books while you’re at it! Amy was nice enough to share a press release with me about her newest book, including an informative Q&A that I enjoyed reading. Hope you do too! “Awww!” It’s something you can’t help but squeal when you see baby animals, especially when at the zoo. Fuzzy chicks, playful elephants, even tiny turtles soften people’s hearts. Every birth that occurs at the Oklahoma City Zoo is extra cause for celebration, because many of the animals are so rare. The most famous zoo baby is Malee the elephant. Her birth in 2011 was historic—the first elephant baby for Oklahoma City! The community fell in love with her, and visitor traffic increased by 150,000 people during her first few months. In December, she was joined by a sibling. This elephant cuteness has generated excitement since 2009 when their mother Asha, one of the Zoo’s adult female Asian elephants, began breeding. The public was apprised every step along the way, following Asha through her two-year pregnancy with Malee and her second calf due before the New Year. “An elephant birth is a significant event for our community. There is a strong connection between Oklahomans and our elephants,” Rennels said. Zoo babies have a large following, and people will follow their life stories for generations. The recent birth of a baby gorilla, Kamina, made international news when she went to the Cincinnati Zoo to be raised by a surrogate mother. Oklahoma City staff knew that Kamina would not do well with her birth mother, so a different gorilla troop was a better option. Oklahoma City, on the other hand, has earned the reputation as a surrogate zoo for chimpanzees. Recently, two different baby chimps were “adopted” and are now successfully living with their new troop. The zoo added another surrogate success to its list in November when an African Wild Dog had three puppies. The inexperienced mother showed lack of maternal care, so the staff removed the pups and arranged for a lactating domestic dog to feed and care for these genetically important pups. Lilly, a golden retriever from Kansas raised the three pups right along with one of her own until they all were weaned. Beyond the famous babies, the zoo is host to all sorts of animal younglings. Raising a flock of flamingo chicks is a bi-annual project for the zoo’s bird keepers. Flamingo eggs are gathered up and incubated, and then the fluffy hatchlings are cared for until spring, when they are integrated into the flock. In this case, because of our native rat snake population our best option for our flamingos is to pull their eggs and hand-raise chicks. Baby lorikeets are also hand-raised, but for a different reason—they live in an exhibit that people walk through. “We’ve learned over time, that by hand-raising lorikeet chicks they become more friendly birds for our guests to feed and interact with,” said Holly Ray, zookeeper. Because of the zoo’s commitment to conservation, most births are well orchestrated. Breeding decisions for endangered species are made by specialized committees worldwide. Mating partners are determined by the individual’s DNA, current offspring in the gene pool, and whether zoos have room for a future baby. A half-century ago, zoos had a different philosophy about breeding—have as many babies as possible! Why? First, the genuine fear of extinction resulted in a “baby factory” mentality. Second, selling surplus animals, often as pets, was a viable way of making money. Over time, those practices shifted to focus on better care for fewer animals. Last year, only a handful of reptiles and birds hatched babies, and only a dozen mammals were born. High-profile mammals, like Rupert the baby rhinoceros, generate the most interest. Occasionally a non-mammal baby makes headlines, such as the two Komodo dragon hatchlings who came to the zoo a few years ago. Although they aren’t huge yet—they will be, and visitors enjoy watching them grow. For the most part, pregnancy is a managed process, and staff members are prepared when a baby arrives. In extreme cases, such as the baby elephant births, fully-trained teams spend the night at the zoo, ready to help with delivery. Another change in practice was the elimination of the zoo nursery. Visitors really enjoyed looking through glass windows at rooms full of baby animals, but zoo professionals now advocate that offspring stay with their parents whenever possible. Every endangered species born into a zoo is part of a viable effort to conserve the species for the future. 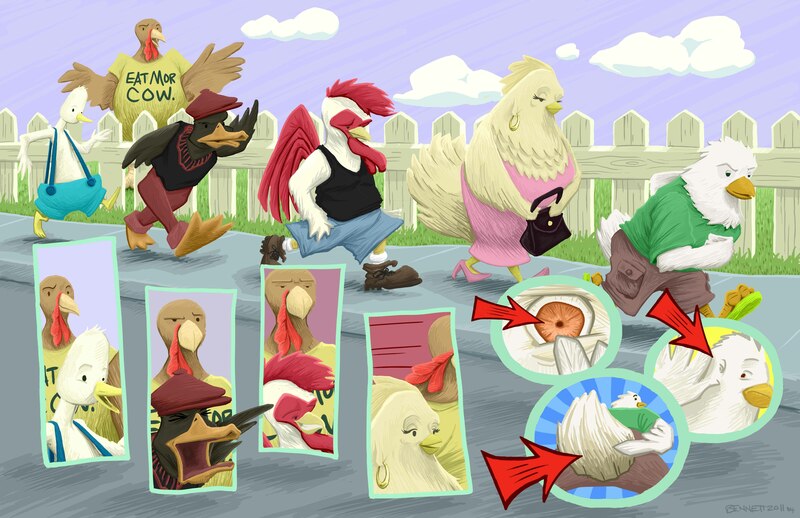 Technology and social media, such as cameras showing footage online, allows visitors to have the up-close experience they previously had at the nursery window, and news media keep the public informed of animal births. More exciting babies are on the horizon at the Oklahoma City Zoo—and zoo fans will have a front-row seat to view fluffy, hairy, scaly cuteness. Learn more about the Oklahoma City Zoo at www.okczoo.com. Jan McGuire painting, printed with permission. 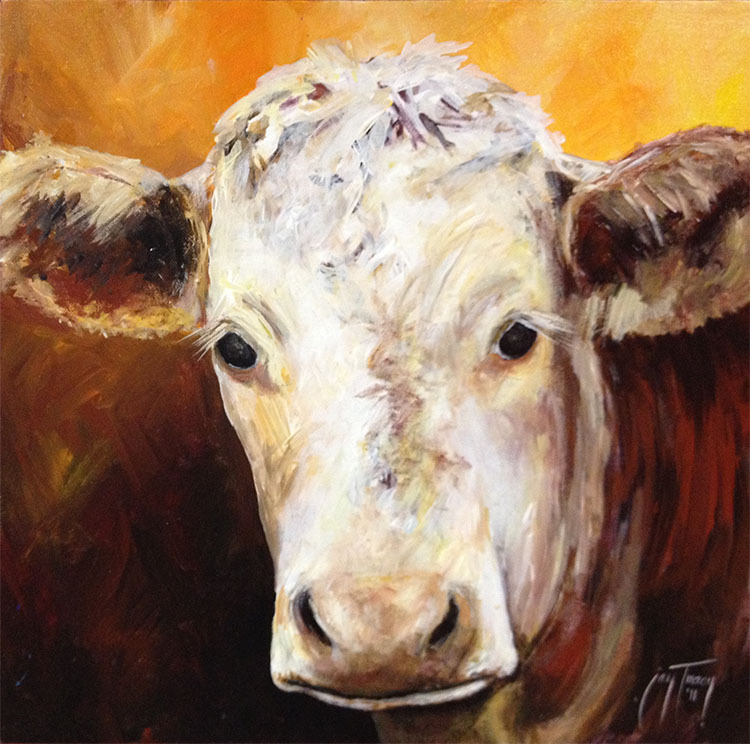 Jan McGuire (Bartlesville) paints so that viewers can step into a scene and feel as if they are there. Not surprisingly, she uses photographs and travel experiences to make her acrylic art very realistic. “I study nature. I go outside every day. Nature is so diverse that I never have trouble coming up with ideas to paint,” McGuire said. McGuire, who specializes in bird and mammal paintings, has exhibited her art globally, from Tanzania to the Smithsonian. She and her husband, a professional wildlife photographer, visit the zoo multiple times each year, seeking to capture the fine details that cause people to step into a scene, to feel the velvet moss, and to smell the flowers…. 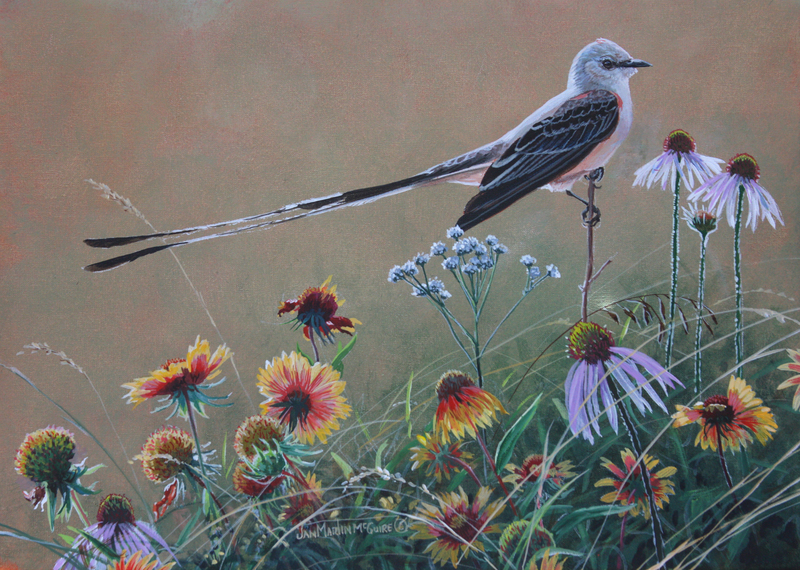 Her scissor-tailed fly catcher painting is a direct result of a visit to the zoo. 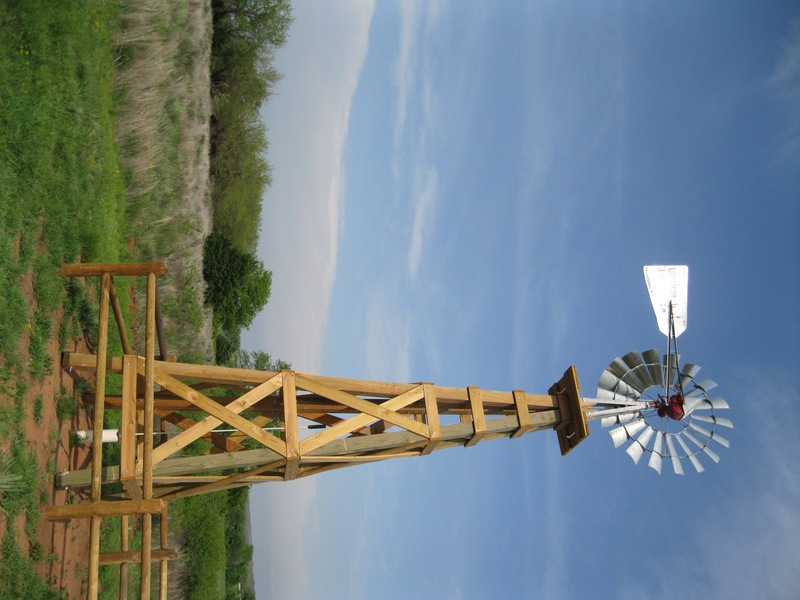 She added tall grass prairie wildflowers to create an accurate habitat for the background. Jay Tracey painting, printed with permission. It’s no surprise that Jay Tracy (Oklahoma City) became a painter, because his parents have owned an art company since 1968. After experimenting with different mediums since childhood, he now specializes in realism, landscapes and animal portraits. Working as a graphic artist for ten years at the Oklahoma City Zoo has allowed him to dabble in many different styles, from designing event posters on the computer to carving foam props for Haunt the Zoo. He particularly enjoys creating the ZooZeum exhibit panels. As an evening job, Tracy teaches painting classes at the Paint Your Art Out gallery. He creates an original design, and then he leads the students in creating the same painting, but with their own unique style. His most requested themes are nature paintings. In an effort to help animals, Tracy shares his artistic skills by offering special painting classes, in which the proceeds go toward the zoo’s rhino conservation fund. Each year he creates a new design, like the Serengeti landscape or this year’s popular peacock design. Jerry Bennett painting, printed with permission. 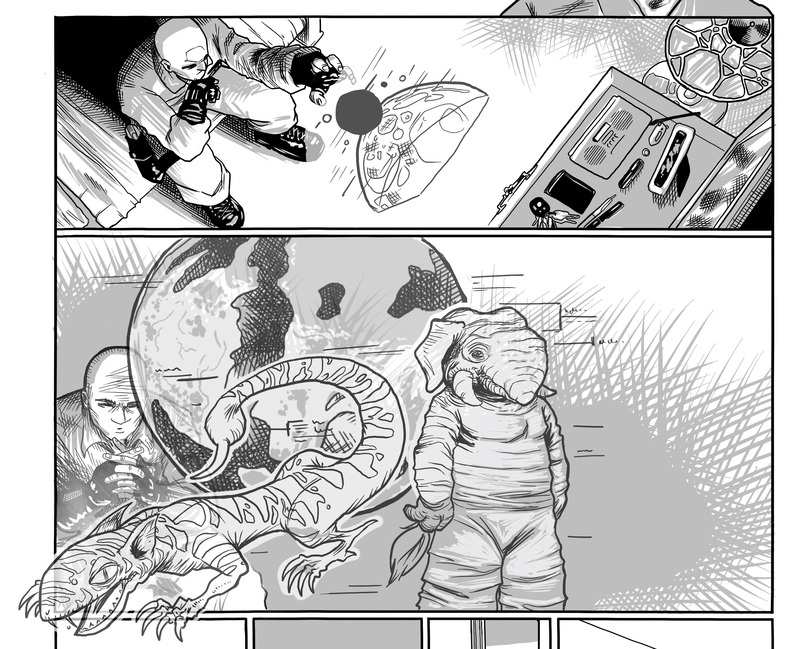 From superheroes to children’s picture books, comic art is a pop-culture craze, and Jerry Bennett (Edmond) is making a living drawing it. Jerry Bennett drawing, printed with permission. Early in his career, when Bennett’s “real job” was working at a door store, he did picture books and portraits as a side job. His big break came when he designed a Ghost Busters/Star Wars t-shirt design. Now Bennett sees his drawing skills coming together, because many children’s books are starting to rely on comic book style art. However, many adults are familiar with Bennett’s art. Last year, he created a popular illustration of the Thunder basketball team for the cover of the Gazette and an Avengers design for the cover of the Oklahoma Humanities magazine. Jerry Bennet drawing, printed with permission. Don’t be surprised to see Bennett at the zoo with his sketch book and fellow artists. He’s found that the zoo is a great location for “sketch crawls.” Artists go from exhibit to exhibit, drawing animals and creating story ideas. Sometimes people cry when they see Cliff Casey’s artwork. That’s because Casey (Norman) specializes in drawing favorite animals and special moments in people’s lives. 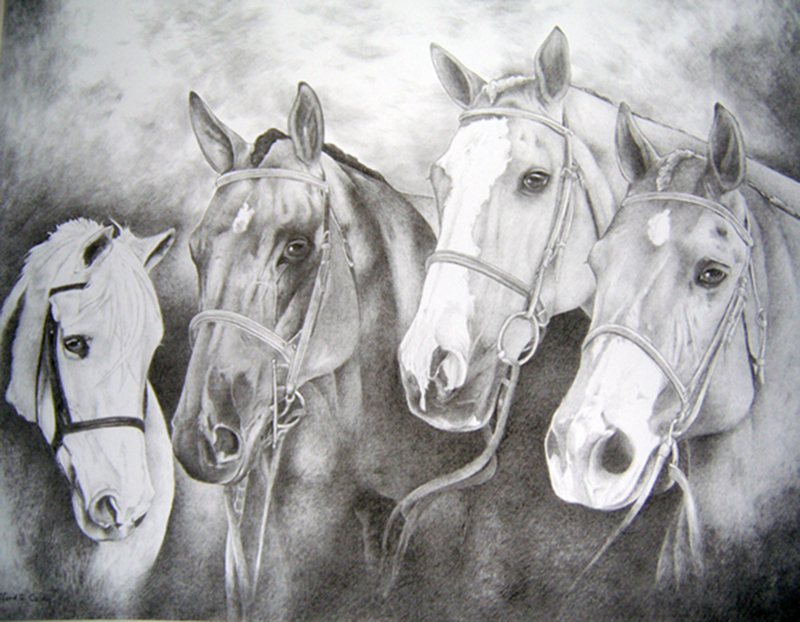 Cliff Casey horse drawing, printed with permission. Casey works from photographs, sometimes combining people, animals, or locations together into one scene. The zoo recently commissioned Casey to paint a portrait for Byron J. Gambulos, upon his retirement from the Zoological Trust. Gambulos and his wife, Patricia, had their first date at the zoo in the 1940s. Using an early photograph of 1940s visitors and the zoo’s original entrance, Casey recreated that special moment on canvas. 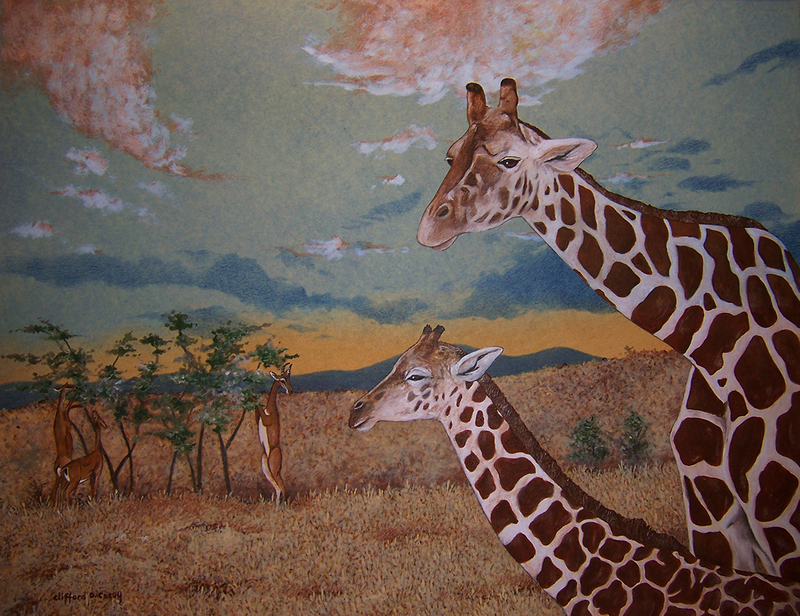 Cliff Casey giraffe painting, printed with permission. Casey has worked as a graphic artist at the zoo for 14 years. He really enjoys creating two and three dimensional artwork. Right now he’s carving a new sign for the Dan Moran Aviary out of a sign material that looks like wood. He nearly went to college to train as a park ranger, until a counselor talked him into going to art school instead. Now, Casey’s wildlife illustrations of turkey, deer and bears are published in many sportsman magazines. This week, I had the pleasure of installing a new museum exhibit on the life of George Miksch Sutton (1989-1982). Sutton is best known for his thousands of bird illustrations. Because he was a professional ornithologist (bird expert), it is not surprising that his artwork is very detailed and precise. Whenever he observed birds in the wild, he took careful notes in his field journals. These notes later made it into the many books he wrote. 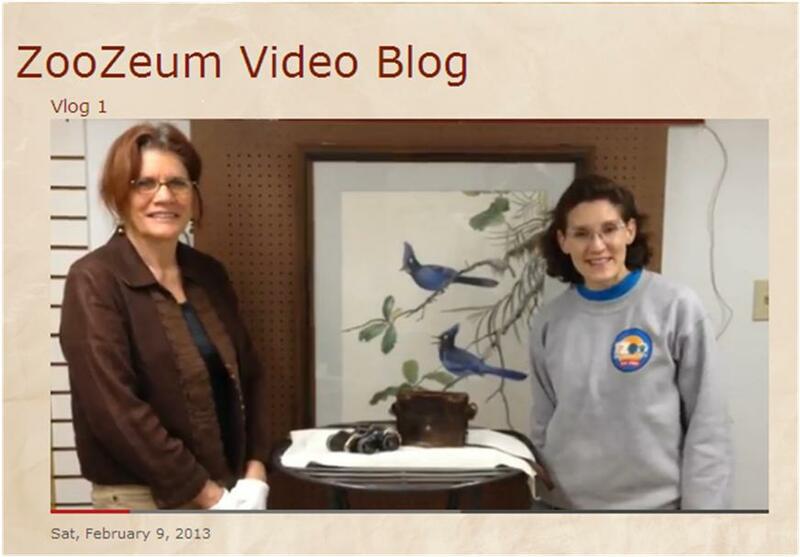 Click http://www.okczooed.com/zoozeum-video-blog to see a 1.5 minute behind-the-scenes of the new Sutton exhibit at the Oklahoma City ZooZeum. I discovered Sutton’s connection to the Oklahoma City Zoo over a period of two years. It began when our graphics department found a bronze bust of him, buried in a back closet. Later, I found some of his autographed books in the zoo’s library. 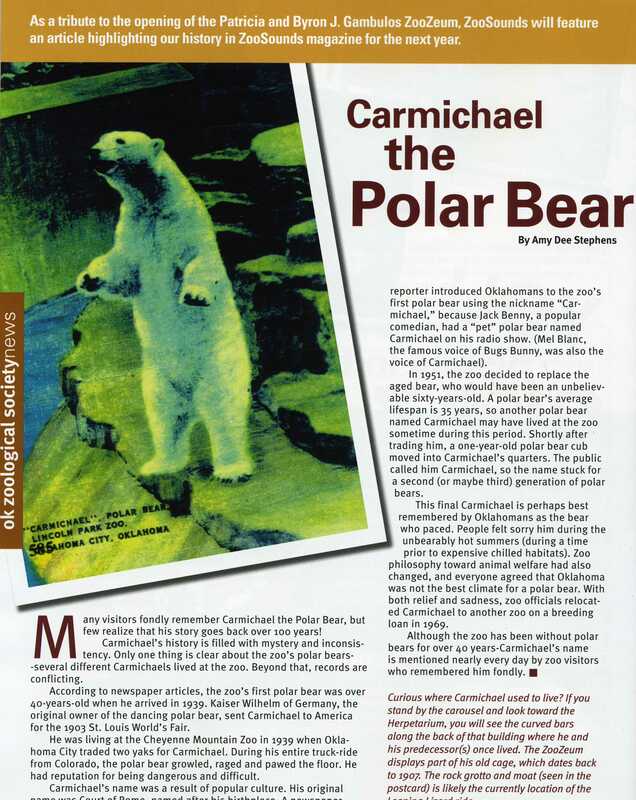 As all historians do, I started connecting the pieces and discovered that he used the zoo as a source of inspiration, led zoo member safaris, and even had two previous exhibits named in his honor. 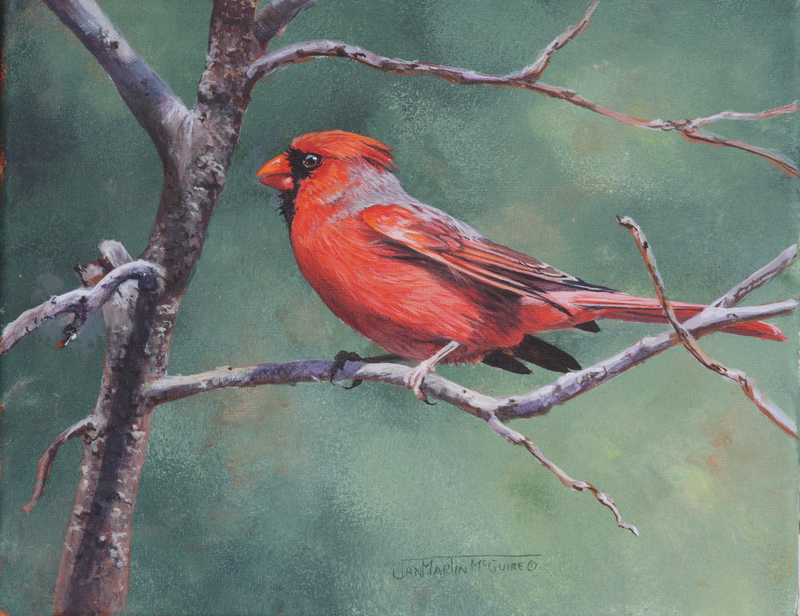 RENOWNED BIRD ARTIST HONORED THROUGH OKC ZOO ART EXHIBIT A new exhibit, In Feathered Detail: The Art of George Miksch Sutton, debuts Monday, February 18, at the ZooZeum, Oklahoma City Zoo’s historical museum and gallery. 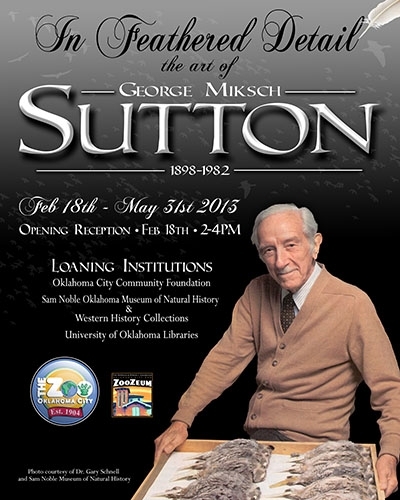 This exhibit showcases the talents of world-renowned ornithologist George Miksch Sutton. Sutton, who died in 1982 at the age of 84, was an acclaimed bird artist, researcher, author, scientist and teacher whose life’s works are still influencing bird enthusiasts today. The date of the exhibit’s opening ceremony coincides with the Zoo’s free admission Monday, allowing the public to participate in the festivities without charge. An opening reception will be held from 2 p.m. to 4 p.m. at the ZooZeum with refreshments, art activities and a visit from one of the Zoo’s live feathered friends. The exhibit is made possible with help from several lending institutions, including the Oklahoma City Community Foundation, Sam Noble Museum of Natural History and the University of Oklahoma Libraries’ Western History Collections. Sutton, whose first bird drawings were published in his early teens, was a long-time friend and supporter of the Oklahoma City Zoo. 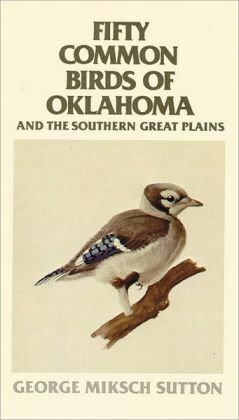 He became intrigued with Oklahoma’s rich variety of birds in the 1930s, became a professor of zoology at the University of Oklahoma in the 1950s and began writing and illustrating books on Oklahoma birds in the 1960s. He was inducted into the Oklahoma Hall of Fame in 1967. In the 1970s, Sutton helped guide three safari expeditions with Oklahoma Zoological Society members and Zoo staff, including the Galapagos Islands, the Amazon and Mexico. The Zoo has dedicated two previous animal exhibits in his honor: the Amazonia in 1974 and Galapagos Islands in 1981. The exhibit will remain open during Zoo hours from 9 a.m. to 4:45 p.m. daily through May 31, 2013. Zoo admission is required. The ZooZeum is located adjacent to the Zoo’s Elephant Pavilion in the Elephant Habitat. Originally built as a bathhouse, the 76-year-old building was opened to house the Zoo’s historical archive and two museum galleries. The ZooZeum enables visitors to discover the Zoo’s history and reconnect with their own zoo memories. Can’t afford that jungle excursion or African safari this year? Oklahomans have the rare chance to join their own animal expedition in search of disappearing wildlife in the Great Plains. The Oklahoma Department of Wildlife Conservation (ODWC) is desperately seeking manpower as they gather data about local species. 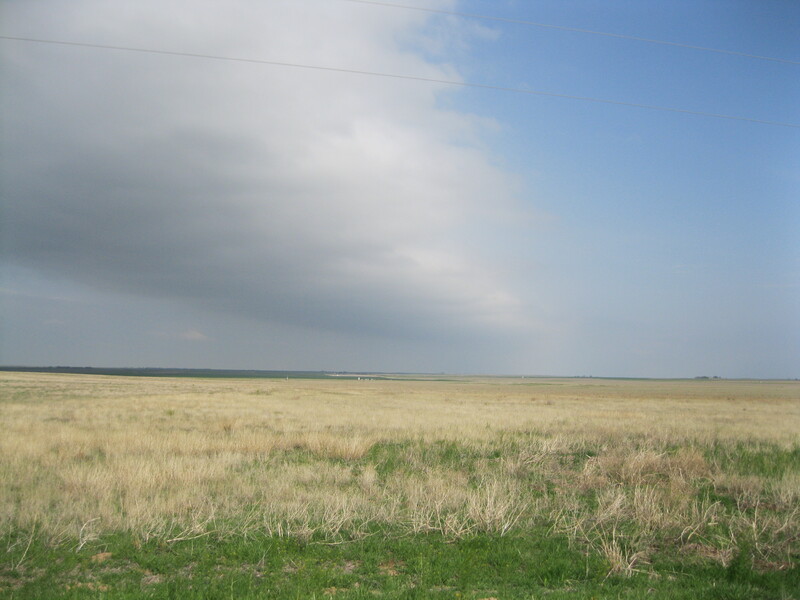 Site of the 2012 Prairie Chicken research project, Cheyenne, Oklahoma. Photo by Stacey Sekscienski. In April, 18 zoo employees made the week-long trek to northwest Oklahoma to help ODWC discover if Lesser Prairie Chicken populations are declining or holding steady. Poor results might land the bird on the federal Endangered Species List. Unfortunately, the Great Plains is disappearing at an alarming rate as land is developed for crops and the oil and gas industry. Surveys indicate that only 10% of the birds’ original home range remains intact. Concerned citizens are faced with the on-going challenge of balancing human advancement and wildlife conservation. How is the prairie chicken faring at this point? It’s too early to tell. Four or five years of survey data is required to make a determination—and the prairie chicken is not an easy bird to spot! In fact, it is so difficult to find, that the preferred survey method is to listen for its call. Each spring, male prairie chickens gather on a high spot with sparse grass, called a lek. They “perform” for the females by lowering their wings and tail feathers, puffing up purple neck sacks, and strutting around. They also jump up and down, making loud booming and bubbling sounds. The booming can be heard a mile away on a calm day. In order to avoid interrupting the bizarre courtship ceremony, researchers keep their distance. 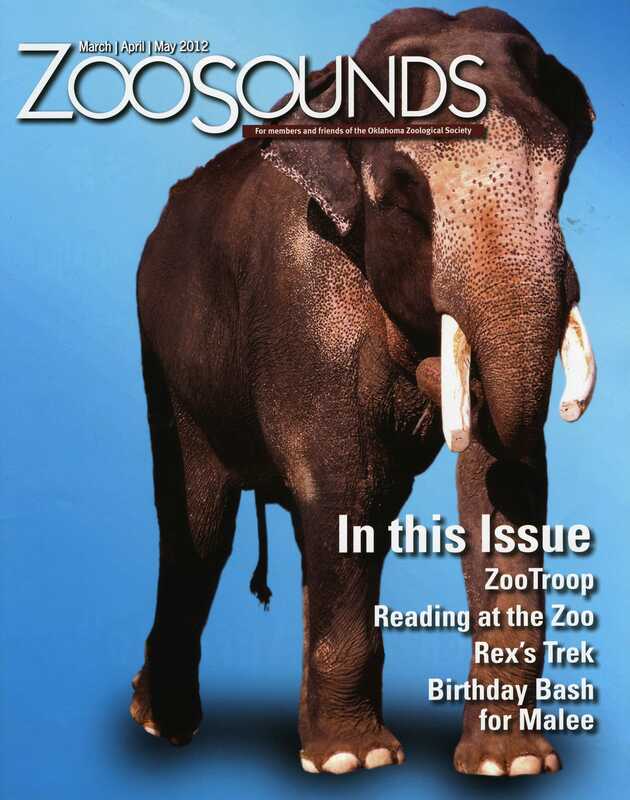 Zoo employees who participated in the project were trained to identify the booming sound by listening to a recording. To actually see the birds on the prairie was considered a big bonus. As with any field work, problems arose. Site of 2012 Prairie Chicken Survey. Photo by Stacey Sekscienski. Despite low returns this year, the staff felt good about their efforts. Most plan to help again next year. “Yes, I take care of birds at the zoo, but going out and helping local wildlife is really practicing our message of conservation. I’m not originally from Oklahoma, but I can help be the eyes and ears for Oklahoma species,” said Zbytowski. The first year for the Lesser Prairie Chicken Survey was 2011. The zoo’s conservation committee dedicated $20,000 both last year and this year to the project, in addition to donating zoo employee assistance. Although this year’s results are unannounced, last year’s nearly-500 survey spots netted 53 “hearings” and 33 sightings of prairie chickens. Only time will reveal the significance of these numbers. 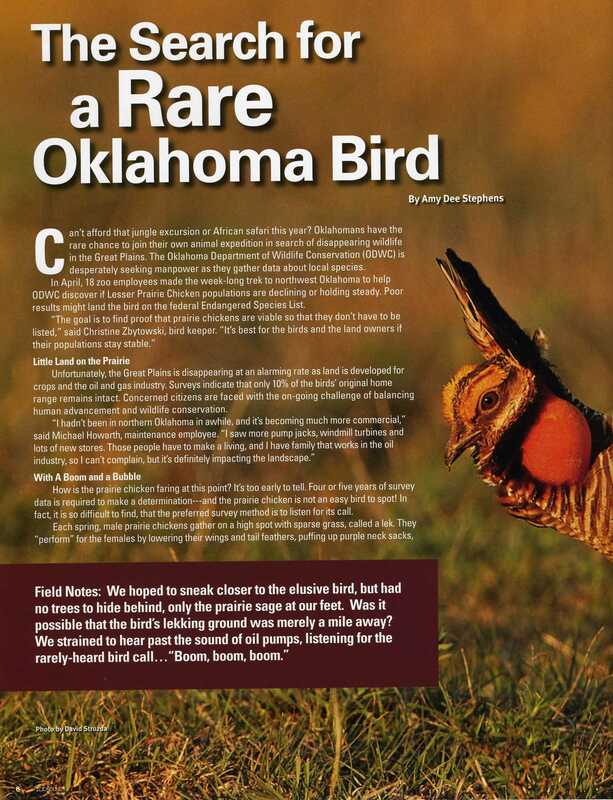 Would you like to hear or see this rare Oklahoma bird on its lekking grounds? Consider joining the efforts of the ODWC. 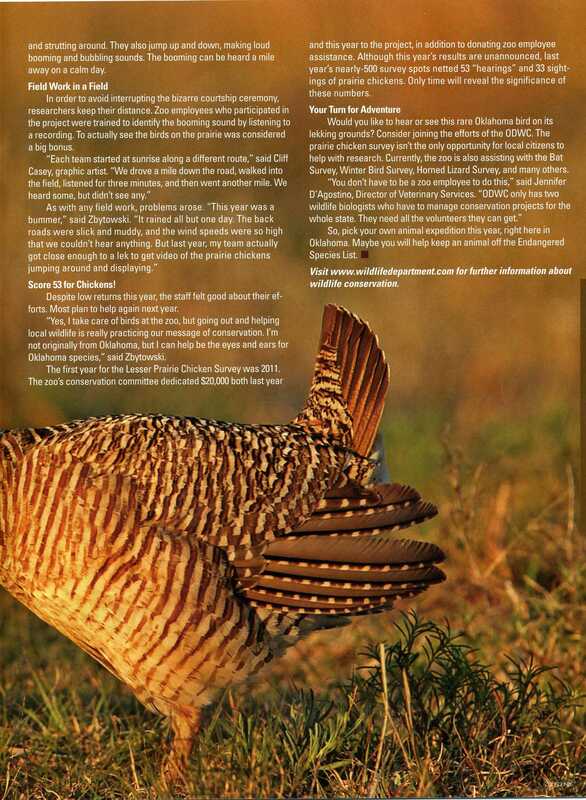 The prairie chicken survey isn’t the only opportunity for local citizens to help with research. Currently, the zoo is also assisting with the Bat Survey, Winter Bird Survey, Horned Lizard Survey, and many others. So, pick your own animal expedition this year, right here in Oklahoma. Maybe you will help keep an animal off the Endangered Species List. 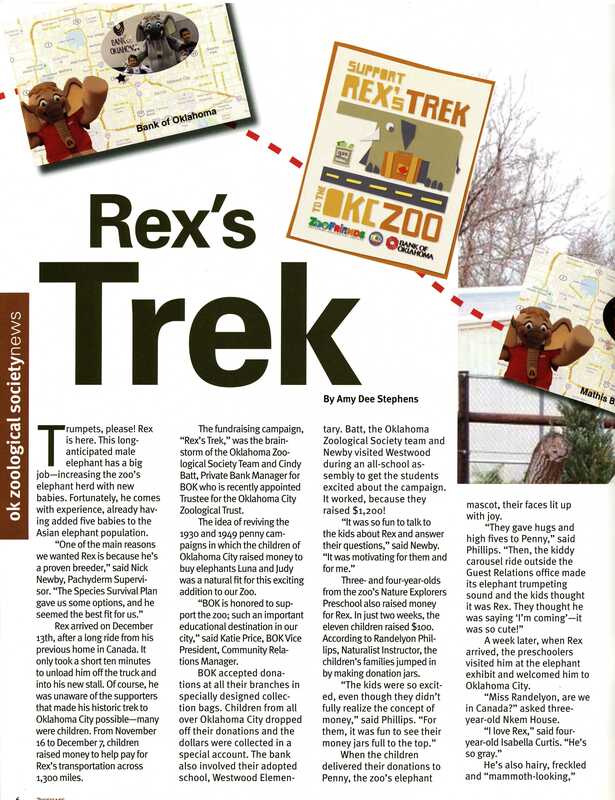 “Rex’s Trek” article from ZooSounds, Spring 2012 edition. Trumpets, please! Rex is here. This long-anticipated male elephant has a big job—increasing the zoo’s elephant herd with new babies. Fortunately, he comes with experience, already having added five babies to the Asian elephant population. Rex arrived on December 13th, after a long ride from his previous home in Canada. It only took a short ten minutes to unload him off the truck and into his new stall. Of course, he was unaware of the supporters that made his historic trek to Oklahoma City possible—many were children. From November 16 to December 7, children raised $1,300 to help pay for Rex’s transportation across 1,300 miles. 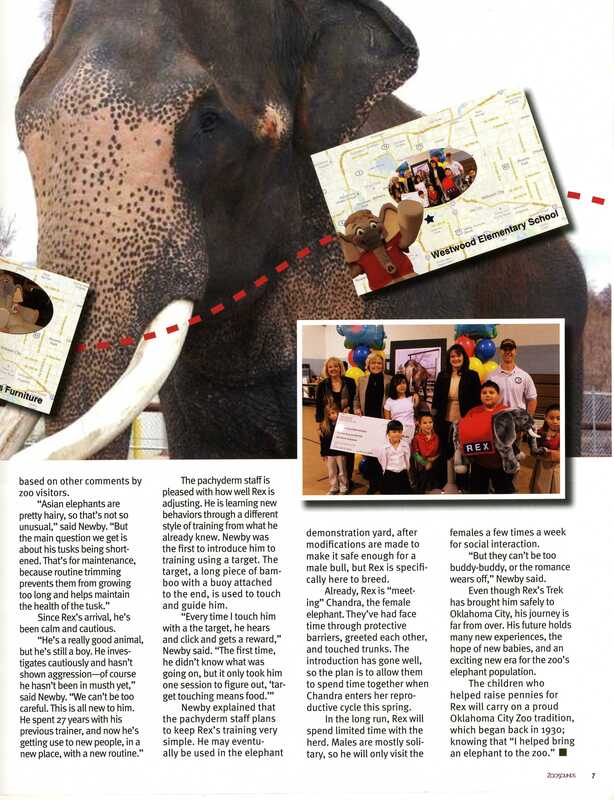 The fundraising campaign, “Rex’s Trek,” was the brainstorm of Dana McCrory, Director of the Oklahoma Zoological Society and Cindy Batt, Private Bank Manager for BOK who was recently appointed Trustee for OZS. The idea of reviving the 1930 and 1949 penny campaigns in which the children of Oklahoma City raised money to buy elephants Luna and Judy was a natural fit for this exciting addition to our zoo. “BOK is honored to support the zoo; such an important educational destination in our city,” said Katie Price, BOK Vice President, Community Relations Manager. BOK accepted donation at all their branches in specially designed collection bags. Children from all over Oklahoma City dropped off their donations and then dollars were collected in a special account. The bank also involved their adopted school, Westwood Elementary. Batt, McCrory and Newby visited Westwood during an all-school assembly to get the students excited about the campaign. It worked, because they raised $1,200. Three- and four-year-olds from the zoo’s Nature Explorers Preschool also raised money for Rex. In just two weeks, the eleven children raised $100. According to Randelyon Phillips, Naturalist Instructor, the children’s families jumped in by making donation jars. 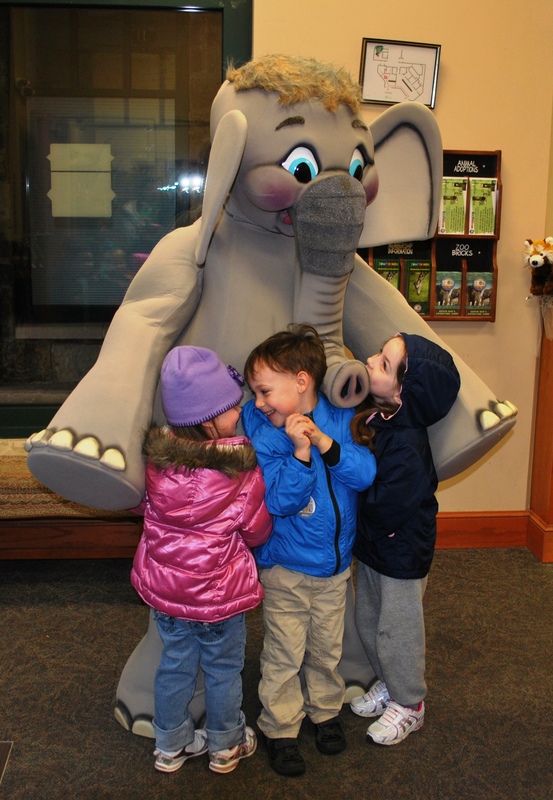 When the children delivered their donations to Penny, the zoo’s elephant mascot, their faces lit up with joy. Preschool children give their money to zoo elephant mascot. Photo by Randelyon Phillips. A week later, when Rex arrived, the preschoolers visited him at the elephant exhibit and welcomed him toOklahoma City. “Miss Randelyon, are we inCanada?” asked three-year-old Nkem House. He’s also hairy, freckled and “mammoth-looking,” based on other comments by zoo visitors. Since Rex’s arrival, he’s been calm and cautious. The pachyderm staff is pleased with how well Rex is adjusting. He is learning new behaviors through a different style of training from what he already knew. Newby was the first to introduce him to training using a target. The target, a long piece of bamboo with a buoy attached to the end, is used to touch and guide him. Newby explained that the pachyderm staff plans to keep Rex’s training very simple. He may eventually be used in the elephant demonstration yard, after modifications are made to make it safe enough for a male bull, but Rex is specifically here to breed. Already, Rex is “meeting” Chandra, the female elephant. They’ve had face time through protective barriers, greeted each other, and touched trunks. The introduction has gone well, so the plan is to allow them to spend time together when Chandra enters her reproductive cycle this spring. In the long run, Rex will spend limited time with the herd. Males are mostly solitary, so he will only visit the females a few times a week for social interaction. “But they can’t be too buddy-buddy, or the romance wears off,” Newby said. Even though Rex’s Trek has brought him safely to Oklahoma City, his journey is far from over. His future holds many new experiences, the hope of new babies, and an exciting new era for the zoo’s elephant population.